Figure 1: Article in Miami News on May 25, 1968. On April 16, 2019, South Shore Hospital at 630 Alton Road was razed to make room for a new development and a park. To the relief of Miami Beach leaders and many residents, demolition ended a period of the former hospital building sitting idle just north of Fifth Street along Alton Road for more than ten years. South Shore Hospital was originally planned to be built in March of 1964. However, the opening of the hospital was delayed for several years and didn’t open until May of 1968. A Miami News article on Saturday, May 25, 1968, announced that the hospital will admit its first patient on the following Monday. The three-story, 500-bed hospital’s opening was delayed by machinery and equipment held up by the Vietnam war. The present structure is the first phase of a medical center that in 10 years is expected to grow to a 14-story, 500-bed institution. Figure 2: South Shore Hospital in 1999. However, the expansion never occurred. The hospital struggled financially throughout the 1970s and 80s. Crescent Heights bought the hospital in 2004 for $35 million and with plans to upgrade the hospital. The hospital switched from a non-profit to a for-profit entity, but never achieved the success they intended. The building was damaged in 2005 during Hurricane Wilma. Within a year, the hospital filed for bankruptcy and closed for good in 2006. The hospital sat vacant from 2006 until April 16, 2019, when Miami Beach leaders and residents watched as the building was imploded. 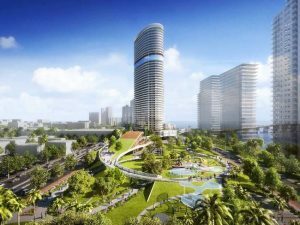 The land for the hospital will be used partly as home to what will be the tallest residential tower on South Beach, and mostly for a new park. The architect for the building and park was designed by Arquitectonica. 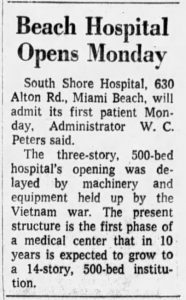 Article: “Beach Hospital Opens Monday”, May 25, 1968 in the Miami News. 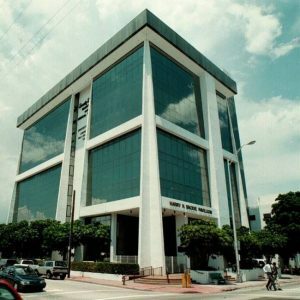 Article: “This Miami Beach building has been an eyesore for over a decade. It’s coming down.”, April 12, 2019 by Kyra Gurney in the Miami Herald. Figure 3: Rendering of Park and new building by Architectonica. Cover: Implosion of South Shore Hospital building. Courtesy of Sun Sentinel. Figure 1: Article in Miami News on May 25, 1968. Courtesy of Miami News. Figure 2: South Shore Hospital in 1999. Courtesy of Miami Herald. Figure 3: Rendering of park and new building. Courtesy of Arquitectonica.